Woke up early this morning. Lying abed ruminating from 4:53 (according to my Fitbit sleep tracker function). Finally decided to get up at 6-ish (didn’t check the tracker or ask Alexa for the exact time). Lit my candles and settled in with my journal and my mini-flashlight. Not sure what journaling actually does for me/anyone. Sometimes it just feels like a boring recitation of what’s going on – the mundane stuff of life. But that’s part of what made the diary of Samel Pepys so compelling – his extraordinary attention to the little details. Anyway, it just feels good sometimes. Discovered a program last night on PBS called Makers: Women Who Make America. All about women’s work in various fields. One episode covered women in comedy. Excellent! Didn’t realize that so many groundbreakers were in comedy: Joy Behar, Whoopi Goldberg, Roseanne Barr, Sarah Silverman, and so on. Another was on film/TV. The interview with Jane Fonda was powerful. How she grew in professional stature and in her ability to be in charge of her own content. To make movies about topics she truly cared about. But my favorite part of that one was the interview with Marlo Thomas about the ending of her series, That Girl. She explained that all the (male) studio executives wanted her to end the series with a wedding to her long-time boyfriend on the show. She balked. They argued. She finally told them, look, ending this with a wedding sends the wrong message to all the young women/girls out there watching who are becoming convinced of the joy of being an independent woman. No, she said. There will be no wedding. In her final episode, That Girl took her boyfriend to a women’s liberation meeting. Thanks, Marlo. And all you wonderful women who care enough to keep opening doors for all of us. Yes, you read that right: Galentine’s Day. Finally, a mere 15 or so years after Psychology Today started its Living Single blog and SWWAN came into being, society is accepting an alternative name for one of the most manufactured holidays of all time – another one of the many bows to romance/coupledom. Society is at last beginning in a small way to integrate the power and realities of single life into the social structure. Perhaps now the previously unchallenged penalties for singles woven into that structure will begin to unravel. The price penalties for solo travelers, the subpar seating/service for solo diners, the insurance penalties for singles, the tax penalties for single filers, and so on. Next step. Let’s stop pretending it’s an aberration to grow up with a single mom. According to the 2017 Census Bureau, 80% of the 12 million single-parent families in the U.S. were headed by single moms. Time to get real on the benefits and policies in our workplaces – ‘cuz these moms are raising the next generation of employees for your companies. Good idea. Let’s see this spread to other countries. This is a little rant about growing older. You retire. You’re okay as far as money goes – between Social Security and whatever savings or retirement plans you have. Now you face the big challenge – how to allocate your most precious possession: your time. As a single person – whether divorced, always single or widowed – you have sole control of that treasured resource. Did you ever wish you could just sit and read for hours every day? All my life that was a frequent dream of mine. Did you imagine how great it would be to stop having to earn a living? I’m guessing most of us did at some point…even those who loved their careers surely got tired at times. Did you dream of traveling? If you did and you’ve got the money, this must be heaven for you. But reading all the time – much as I love doing it – sometimes feels like an escape. From what, though? Working on my cookbook/memoir, for one thing. Seems every time I turn my mind to it, determined to get moving forward, I run smack into another obstacle. The most recent was the Adobe software program I bought specifically to help me sort through the hundreds of photos I need to go through to choose the right ones for the book. One day, finally, I went to open the program and got – “Please provide us with a serial number and blah, blah, blah.” Of course, it’s been a couple of months since I bought the thing and I have no idea where the serial number is or how to go about doing blah, blah, blah. So then I put on the calendar, “phone Adobe support for help” and have to keep moving it and moving it because other things come up that take priority. So, once again, no progress. Reading fun mysteries and crime novels certainly occupies the mind. And I feel virtuous that often I stand on the matt in front of the kitchen counter and work towards my “250 steps every hour” goal while I read. So, really, I’m not wasting the time. Ever try that – 250 steps every hour? Seems like you can never focus on anything long enough because you have to keep getting up. But I remember often saying to my former husband – who seemed never, even for one minute, to stop reading: books, magazines, newspapers, legal journals, instruction manuals for cameras and other electronic gadgets, and ad infinitum – “When do you have time to process all the stuff you read?” But oh, well, we never know how another person’s mind works. How do you allocate your time? Got guilt about reading or doing other “just entertainment” activities? Wonder if by the time you get in your 70s, you just realize it’s almost all over and who’s going to care what you do anyway? Maybe the trick is to just trust and respect your own feelings. That’s what counts. Whether you believe in an afterlife or not, follow your heart. Yes, it’s that time again. The official holiday week to celebrate the energy and passion and dedication of all single working women. The single working women who earn and bring home the bacon and then cook it, serve it and clean up afterwards. The single working women who come home from work and do all the housework and laundry, care for the pets, and still make time to visit with friends and loved ones. So this July 31 to August 6, take a single working woman to lunch or dinner. Or take out her garbage. Or run an errand for her. Or ask her just how you can help. She’ll appreciate you thinking of her. Tell her it’s her official week and, if she can manage it, she should take some time off and relax. Everybody else has holidays, right? This week, every year, single women do, too. Happy Single Working Women’s Week to you and you and you! …in the early 20th century, Madam C.J. Walker became the first American self-made female millionaire after creating a line of hair care products for African American women in her kitchen while trying to make ends meet as a single mother? …17-year-old Jackie Mitchell, the second woman to play in the major leagues, struck out both Babe Ruth and Lou Gehrig in an exhibition game in 1931, but her contract was voided the next day because the baseball commissioner deemed the sport “too strenuous” for women? …in 1777 16-year-old Sybil Ludington rode 40 miles on horseback through the night (twice the distance of Paul Revere’s more famous ride) to successfully warn Revolutionary Army troops of an impending British attack? …Underground Railroad operative Harriet Tubman planned and led a complex and stunningly successful raid on the Confederacy with 300 Union troops in 1863? Cool stuff. Hopefully we’ve got more women writing history these days and we’ll start to see more credit given to women where it’s due. Last week was Single Working Women’s Week. In addition to helping out a favorite single mom, this SWWAN was tightly scheduled, what with birthdays and all. Including also reading a new book I agreed to review: Everyday Healing by Janette Hillis-Jaffe. The subtitle is Stand up, Take Charge, and Get Your Health Back…One Day at a Time. If we substitute “Groove” for “Health,” that sounds like a good prescription for life, too. And one that fits single women to a T. Not everybody has to stand up and take charge quite as vigorously as single women do. But stand up, we do. And take charge, we must. This book chronicles the struggles the author went through to conquer a six-year-long mystery illness that had her severely debilitated and depressed. Despite valiant efforts, doctors weren’t helping her. Nearly half of Americans struggle with illness—heart disease, diabetes, fibromyalgia, arthritis, cancer and chronic pain, to name a few. One-third of our population is obese. In her book, Hillis-Jaffe provides daily action steps to help eliminate undesirable habits and substitute new paths to health. You get practical tips on a bunch of topics—from how to organize your kitchen to help you cook healthier meals, having tough conversations with an unsupportive friend or lover, to how to fire your doctor—and a plethora of encouraging words on building your confidence that you can recover your health…and your life’s direction if it’s not going where you want it to go. She recommends doing as much research as you can about your condition, and make it an ongoing project. She talks a lot about getting support from other people—something many of us are not good at. Asking for help is a foreign concept for many single women especially (though most men have a rough time at that, too). She talks about why it’s important and how to do it. And she talks about ways in which these steps have proven their power to change lives. If you’re struggling with an illness or obesity or other persistent health challenge, this book offers food for thought—and ideas for action. Another book I highly recommend that might well change your life for the better is The Life-Changing Magic of Tidying Up: The Japanese Art of Decluttering and Organizing by Marie Kondo. The author is a tidying consultant who has helped hundreds of people transform their homes and offices from places of hidden (or obvious) clutter to peaceful, clutter-free environments that promote calmness and clarity. She says that her clients always succeed in staying clutter-free if they follow her plan. She suggests doing it all in one time period, as short as possible, as the only way to make the new way of living stick. One of her most amazing tips is to store everything vertically—no piles of clothes, papers or stuff allowed anywhere. Even clothes and socks, she says, should be folded and stored standing up. I haven’t yet undertaken her whole program, but I used this simple trick to transform my sock drawer—a drawer that had been driving me crazy for months because it was so packed and I didn’t know what all was in there. Now it’s neatly organized, and I know exactly how many (don’t ask!) pairs of trouser socks and gym socks I actually have. If you’re someone who buys more of a thing because you don’t really know how many you have, only to find you’ve duplicated your purchase (again), you will be amazed at Kondo’s simple plans. And remember her strong advice: don’t start storing until you’ve gone through every piece in a category and ruthlessly discarded anything that does not spark joy. Read the book. It’s fun and it’s enlightening. 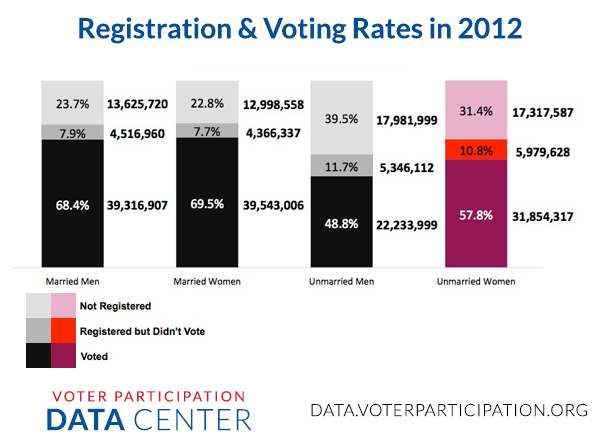 A new source of in-depth data and analysis about unmarried women and what’s known as the “Rising American Electorate” is now available at Voter Participation Data Center. It’s interesting and puzzling to see from the graphic (below) that so many single women did not vote—even ones who were registered—in recent elections. What’s up with that? There are 57 million unmarried women in America today—and by the time the 2016 election rolls around, they’ll be a majority of voting-eligible women. The Voter Participation Data Center aggregates research on the social, economic, and political lives of unmarried women, giving a complete picture of the ways in which they’ll shape our economy and our policies in the decades to come. It’s got demographic and economic profiles of unmarried women and analysis on the recent legal and electoral developments that most affect the lives of unmarried women—including paid sick leave, equal pay, workplace fairness, and the Affordable Care Act. The Voter Participation Data Center puts out all this data in the form of shareable graphics that encapsulate it in a quickly-readable and easily-digestible form, making it easy for you to make your friends, family, and political leaders aware of how important unmarried women are going to be in the coming decades—and how important it’ll be for political leaders to speak to their needs and concerns. Voter Participation Data Center is intended to serve as a one-stop shop for anyone interested in understanding unmarried women—who, along with people of color and millennials, form the Rising American Electorate who may cast a majority of the votes in 2016. Just in time for Single Working Women’s Week this August 2 through 8, 2015. Attended a wedding yesterday. Outside in the terrace garden of one of the country’s biggest and loveliest conservatories. The previously long-time single bride was gorgeous—of course she’s my daughter, but you be the judge—in her strapless wedding gown composed of layer upon layer of form-fitting ivory chiffon that slid down into a flare and a small train. I didn’t take many photos. Funny, how trying to be in the moment makes taking pictures too much of a diversion. But one I did take clearly shows the friend-professional-photographer doing his job. Good thing people can hire such services—so they can enjoy their own events. When I look at the few photos I took myself, I’m glad to have caught some of the beauty and a little of the drama of what was going on. It wasn’t without trepidation the bride had been pondering the loss of her official status as an independent single working woman. Fortunately, the groom has promised faithfully to let her keep her tool belt and fix the toilet and take the garbage out herself any time she wants. And for the almost-eight-year-old daughter of the bride, knowing that a third (male) person will now be part of the family inner circle is a sea change of unknowable immensity. The bride’s friend performed the beautiful ceremony. Lovely, heartfelt sentiments, including a pledge between the new couple and the little girl. An emotional time for all. The handsome couple are off to Cancun today. Yep. My daughter’s married. And guess what? Her birthday is August 4…the same day as the official holiday Single Working Women’s Day. I write two columns for Examiner.com: Chicago Lady Boomer Examiner and Chicago Restaurant Examiner. They changed their policy recently and decided we writers who keep their website pages full of fascinating, informative, newsy or simply interesting information must not write our material in the first person. In other words, no editorial stuff; write the way salaried reporters write. I thought, oh, well, they changed their policy, and I started writing that way as much as possible. Today I discovered that not only did they change their policy but they actually went through and un-published posts that retroactively did not comply with the new directive. Wow. Life doesn’t look quite the same at 50 as it is does at 60 or 70. I personally didn’t start thinking differently about past and future until I was into my mid- to later 50s. And there just isn’t a better time to reflect on such things than the end of year. Another year of a down economy. Another year of significant physical challenges–had a hip replaced this year and let me tell you, the recovery is a bear. Another year of working at remaining centered while the media keep continually reporting bad news. Having watched the endings of two different versions of the Charles Dickens story, Christmas Carol, I’m thinking of Scrooge’s lessons with the spirits of Christmas past, present and future. It’s wonderful how often we can experience the same thing (I also find it so with books and movies) at different times in our lives and get something completely different out of it. I’m sitting here in my living room on Christmas eve morning with candles burning merrily on the coffee table, jazzy Christmas music flowing through my venerable (had them nearly 40 years), irreplaceable McIntosh stereo speakers, and life feels terribly precious in spite of it all. No matter how much I love my “stuff,” there’s a freedom to letting it go out and bless others in the universe. In my current neighborhood, west Logan Square, I don’t even have to drive over to the thrift store. Just carry a box or a bag or a small piece of furniture out to the dumpster and it’s gone in minutes. Sometimes it gets into someone else’s car before you can put it on the ground. Whatever you do to celebrate this time of year–whether you choose to celebrate with friends or family or you decide to have a peaceful time alone–I wish you the very warmest thoughts. Dismiss any haunting from the past. Refuse to let thoughts of the future ravage your peace today. When it comes down to it, this moment is all we are promised. And it’s all we need. Have a Merry Christmas full of love–if you have grandkids, hold them as tight as you can for as long as they’ll let you. And may your new year begin well–and remain as prosperous and peaceful as you would ever wish. This page took 1.045 seconds of computer labor to produce.